Travelling in Greece years ago, we had a taste of what is happening there now. Banks went on strike while we were there. We had never expereinced something like this before or since. We spent most of our time on Mykonos which is a breathtaking island filled with tourists. Many of the visitors were students who had no access to cashing travelers’ checks or getting money on a credit card. It was before ATM machines. I am not sure why we were ok, probably good planing by my husband. We met many tourists who were stranded in paradise without money. Today, the Greek people are stranded without access to their pension or bank accounts. Meanwhile back in Athens, we had a meal in a family’s home. I had met them on the streets of Rome in a rainstorm. They were on their honeymoon and I shared my umbrella and a chat. I told them we would be in Athens and they gave us their number. And I called when we arrived. She invited us to dinner. When I asked what I could bring for dinner, the hostess asked rather embarrassed, if we could bring some strawberries for dessert. “Of course!’ She went on to say the gorgeous berries were so inflated in price they couldn’t afford a carton . . . even for guests! We had traveled to Greece by ferry ship and had to get to the port when we left to catch the ship. We had tickets that we would lose the money if we were not there. Other tourists were anxious to leave too. There was a bus drivers’ strike. Finally, there was a bus and driver willing to drive us. BUT, we had to lie down in the center isle on top of our children to protect them from being hit by broken glass from thrown bricks! With all our traveling, this was one of the most stressful experiences. Thank God no bricks were thrown at the moving bus or none hit us anyway. Greece was one of the countries we had wanted to visit. 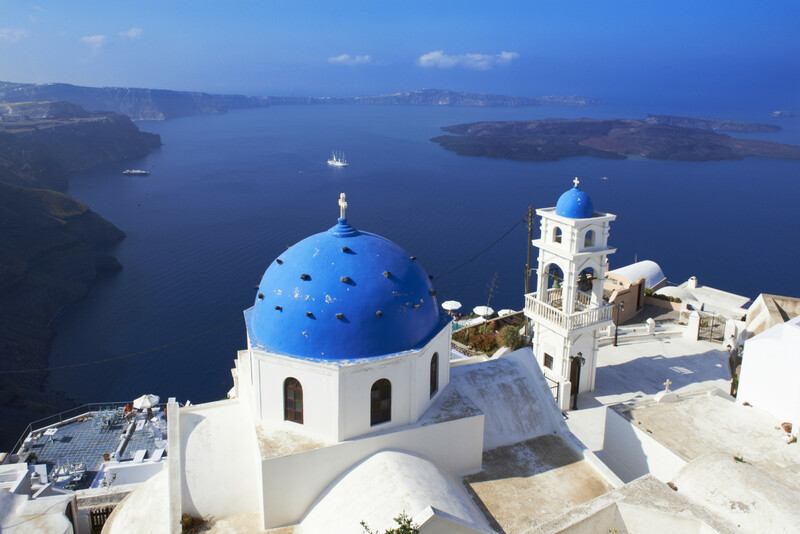 . . birthplace of Democracy, classic architecture, delicious food, exotic islands. Most places we leave hopping to revisit, which is usually a pipe dream. But Greece for us was not a place we recommend or desire to visit again. I wish the Greeks well, and hope their mistakes don’t cause havoc all over the world, affecting us all! These Greek financial problems were obvious to us years ago, leading up to the horrible , seemingly insurmountable level today. Most Americans look at the rerun of the Greek euro crisis with something between smug amusement and condescending disapproval. When will those profligate Greeks get their economic house in order and stop looking to others to bail them out? But, should people living in glass economic houses really throw stones? After all, just like Greece, the United States government has been living beyond its means, running up an enormous debt that will eventually need to be repaid. True, our budget deficit this year will be lower than it has been, just $486 billion compared to $1.4 trillion as recently as 2009. But this is just a temporary respite. Within the next couple of years the deficit will start to rise again. By 2025, we will again face trillion-dollar shortfalls. And even a $486 billion deficit adds to our ever growing debt. Our national debt currently approaches $18.2 trillion, roughly 101% of GDP. That’s right. We owe more than the value of all the goods and services produced in this country every year. It is as if your credit-card bills exceeded your entire pay check. That’s not quite as bad as Greece, of course, whose debt exceeds 177% of their GDP. But it is worse than countries like France or Spain. And give us time! Like Greece, the driving force behind our debt is the growing cost of entitlement programs for health care and retirement. If one includes future unfunded liabilities for Social Security and Medicare, our real debt exceeds $90 trillion. That’s more than five times our GDP. Greece is still in worse shape — their unfunded liabilities top 875% of GDP — but we’re gaining. At the heart of Greece’s problems lies a government grown too big, too intrusive, and too expensive. The Greek government spent nearly half of the country’s GDP last year (49.3%), and that actually represents a decline from the 51.8% it averaged since 2006. The Greek’s may complain about austerity, but they’ve hardly practiced it. Our government is far smaller than Greece’s today. Federal spending is just 20.5% of GDP. But, according to the Congressional Budget Office’s alternative fiscal scenario, that could rise to almost 34% by mid-century. Factoring in state and local government spending, which already accounts for roughly 14.4% of GDP, total government expenditure in the US could reach 48% to 50% in 2050, roughly Greek levels. As government grows, the private sector contracts. Greece has one of the most inhospitable business climates in Europe, ranking 84th in the world in the most recent Economic Freedom of the World Index. Meanwhile, as the United States continues to increase taxes and regulations, we have fallen from the second highest economic freedom ranking just 15 years ago to 12th place. Of course, the United States has some advantages that the Greeks lack. Greece owes a significant share of its debt to foreign governments, while the majority of American debt is domestically held. The United States also faces low borrowing rates, while Greece has been effectively shut out of capital markets. The US debt may be bad, but in many ways we are the fastest horse in the glue factory. As long as the euro remains in crisis, we will continue to be able to borrow money at absurdly low interest rates. The United States also controls its own currency and monetary policy, while Greece is hostage to the European Central Bank, which must balance its interest against those of other countries in the monetary union, many of which are in far different economic positions. The danger for the United States is that spending on entitlements will surge in the coming decades, which means that, absent reform, they take over the economy. Investors would respond to the weaker economic outlook by demanding higher returns in order to continue investing in US bonds, which would further drive up interest costs, making our problems even worse. And, of course, unlike Greece, there aren’t other countries or organizations available to bail us out. Margaret Thatcher reputedly said that the problem with the modern welfare state is “eventually they run out of other people’s money.” “Eventually” has become “now” for Greece. The United States, on the other hand, still has time. If we act now to reduce federal spending and reform entitlements, we can avoid the crisis to come. If not…Greece beckons. This entry was posted in Travel, Uncategorized and tagged austerity, debt, EU, finances, Greece, US. Bookmark the permalink. an amazing culture and lovely people , the ones we got to know. Thanks for taking time to comment. I was in Mykonos in the 70s, it was so beautiful, but for some reason I can’t remember, the locals weren’t very nice to me, even the kids were screaming “stupid Americans” for no reason at all! Wow, I don’t remember experiences like that when we were there in the 80s. It was just tense and not so welcoming as we had in India. But India is an incredible place! Traveling is such a life stretching and educational experience , isn’t it? It was a complete surprise to me! I haven’t done much world travel like my hub, but I was in Germany when my son did his junior year abroad. Now we mainly camp and hike around the US. There are some great places to visit in the US. Lived in AZ for 7 years. all of AZ is wonderful, Jackson Hole Wyoming, Little Big Horn, Charleston SC, Savannah, Georgia, New York City, Boston. . but if you have only one more trips overseas, go to Italy. . . it is living history, great food, the very best architecture from ancient times, paintings, sculpture. They are the best hands down, or that is my opinion! I am sure you were on the side of the animals, right? Rome is large but most of the things you would want to see are in the center and you can walk from place to place. Florence is easy to navigate and so is Venice . . . my favorite place in the world. But New York is high on my list as is Varanasi in India! Good luck with husband. My husband is the planner of the traveling as a professor and architect. I am the beneficiary!